Back on Monday, Labor Day, I wrote about an execrable piece of reporting that appeared on CBS This Morning just over a week ago. The story was about Dorothy Spourdalakis, mother and murderer of Alex Spourdalakis. Earlier this year, Dorothy and Alex's godmother, Jolanta Agatha Skrodzka, plotted for at least a week to kill Dorothy's son, a 14-year-old boy with severe autism. At home in the apartment in River Grove where the three of them lived together, Dorothy and Jolanta drugged him with sleeping pills, and when that did not kill him fast enough, Dorothy, as she admitted and is reported in various media outlets, used a kitchen knife to stab Alex in the chest four times, hitting his heart twice. She then slashed his wrist so severely she nearly severed his hand. The CBS story, however, does not tell the story of cold-blooded, premeditated murder. Instead, it shows Dorothy kissing Alex and washing his feet when he is in the hospital. It portrays her as a loving mother who, pushed to extremes of stress by, as the report says, a system that failed her. What is not in that story are some very important facts that, had the reporter included them, would have made for a very, very different telling. A theme that runs throughout the whole piece was that Dorothy had no support, no help. For example, Dorothy's lawyer is shown, saying, "Every door closed. She had nowhere to go. She had nowhere to take her son. There's no help for him." That is at odds with other reports. For example, the Illinois Autism Society offered support, but Dorothy turned them down and only requested a lawyer. The state's Department of Children and Family Services offered respite care and psychological counseling, but the family refused this help. Also left out of the story is the background of the "documentary" produced by Polly Tommey, of the Autism Media Channel (AMC), as well as her connection to Andrew Wakefield, also of the AMC, who was working on the documentary before Alex's death as part of a reality TV show. And yet another factor omitted was the connection between Dr. Arthur Krigsman, who reportedly diagnosed "lesions" in Alex's stomach, and Andrew Wakefield: they used to work together at Thoughtful House in Texas, and Dr. Krigsman bases much of his treatment philosophy on Wakefield's now-retracted paper purporting to find a connection between MMR vaccine and gastrointestinal disorder. Meanwhile, Alex himself was portrayed as a violent, difficult to manage young man with no hope of a future. It is, sadly, the image that all too often is presented of those with developmental disabilities like autism. And it is false. In the end, many science and autism bloggers rightly criticized the story for its many faults (Liz Ditz has curated a robust list of responses). Now, in my post, I did not mention the reporter's name, because, really, it isn't particularly relevant to the problems with the piece (except insofar as this particular reporter has a history of promoting anti-vaccine pseudoscience). But she has been active on Twitter recently digging an even deeper hole for herself. 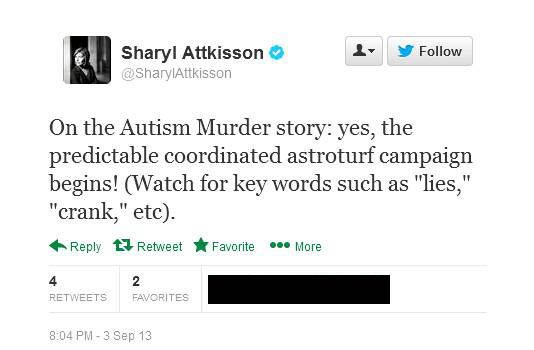 The text reads: "On the Autism Murder story: yes, the predictable coordinated astroturf campaign begins! (Watch for key words such as "lies," "crank." etc)." 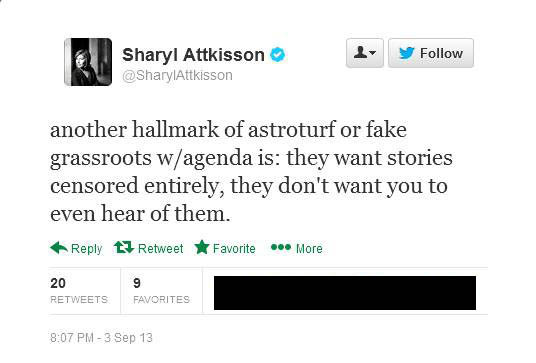 In case you don't know what the term "astroturf" means in this context, Ms. Attkisson goes on to explain in a series of tweets (again, Liz Ditz has curated them into an easy-to-read timeline). 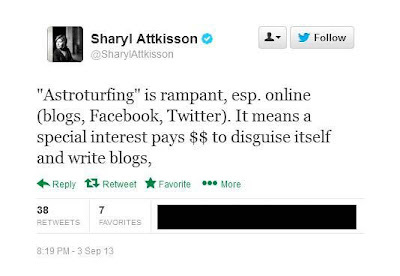 Basically, astroturfing is a tactic where some special interest or sponsor pays individuals to spread a message. It can be multiple individuals in their pay, single individuals using several different identities to create the semblance of a larger group, or some other combination. The purpose is to create the image of a grassroots, objective effort, while in reality being the campaign of a biased interest group. This is nothing more than the "Pharma Shill gambit", a cheap way to write of criticism without actually addressing the concerns raised by the critics. I take offense to this accusation. I write because I care about the topics I cover. I hope to make a positive difference by combating misinformation of the sort promulgated by Ms. Attkisson. I do not receive any compensation for my writing. I'm not a professional journalist, nor a lobbyist. No one pays me to do this. And I've corresponded with a number of the other bloggers who have written about this story, some of whom are either autistic themselves or the parents of autistic children, and they are likewise deeply offended and outraged by Ms. Attkisson's spinning of Alex's murder and this subsequent attempt to dismiss criticism as "astroturfing". She writes, "another hallmark of astroturf or fake grassroots w/agenda is: they want stories censored entirely, they don't want you to even hear of them." This is most likely in response to a Change.org petition, CBS News: Take down the video Behind the Tragedy: Mother Murders Autistic Son. Ms. Attkisson is quite mistaken in her characterization of this, though. The petition, the blog posts. These are not efforts to censor her or keep the story of Alex's murder from being heard. In fact, if you take the time to read the various posts, you'll find that people want Alex's story to be heard, but they want the truth of his story to be heard, not some whitewashing piece of yellow journalism that paints Alex as a violent monster and his murderer as a caring, loving woman who had no other choice. There is always a choice, and Alex deserved better. Now, some of you may feel like reporting these tweets to CBS in an effort to get Ms. Attkisson in trouble. I will say now, unequivocally: DON'T! She is certainly being petulant, little more than a whiny schoolyard child who does something wrong and, when called on it, cries to all her friends that "so-and-so is a big meanie!" Yes, she is behaving in a silly manner, using bad arguments and making defamatory statements about her detractors. But she is doing that as a private person, not as an employee of CBS. Try to understand the distinction between her as a reporter, doing her job on a CBS broadcast, for which she is paid vs. using her personal Twitter account on her own time, expressing her own misguided opinions, for which she is (presumably) not paid. The bottom line is this: my previous post is not part of an astroturf campaign. Nor are the posts of the other bloggers to whom I linked. To accuse us of being paid is offensive, and Ms. Attkisson owes us all an apology. Moreover, it is a serious allegation, considering that there are serious legal implications for people who actually are engaged in astroturfing, if they do not disclose their endorsement. My message to Ms. Attkisson is this: if you have evidence that I or any of the other bloggers that I linked to in my story are part of an astroturf campaign, please present it. Otherwise, admit that you made a baseless accusation and apologize to me and every other person you have painted with your conspiracy brush. Great post Todd and I'm glad you paid special attention to the distinction between personal and professional actions. A distinction I'm afraid will be lost on those who need to know it the most. I wouldn't hold my breath that Ms. Attkisson will retract her whiny accusations, after all she also accused the DOJ of tampering with her computer and has yet to issue an apology for that. It is as if CBS are under some kind of obligation to host Wakefield's advertorial because she has given it her imprimatur. Help! My Fiancé Wants to Invite His Two Former Lovers to Our Wedding.